What do Sting and Vivaldi have in common? Four Seasons. Okay, that might be a bit of a stretch, but I do adore both All Four Seasons by Sting and the Four Seasons by Vivaldi. And, I adore this limited edition, get it in August or be sad, Blended Seasons bundle from Stampin Up! This is another one of those versatile sets that have great sentiments and beautiful images. Add the dies and you can make a ton of cards suitable for any season or occasion. Look, I’ll prove it. For this card, I used Grapefruit Grove cardstock with the matching DSP. On top of that, I layered a 3-3/4″ square of Soft Sea Foam with a wreath with the leaves stamp from the stamp set. The Stamparatus came in handy for that. The bell was done with White embossing powder on So Saffron. The flowers and leaves were cut using the Stitched Seasons Framelits (part of the bundle) from Rich Razzleberry and Mint Macaron. I cut the flowers out of the Rich Razzleberry and added part of the leaves from the leafy die. 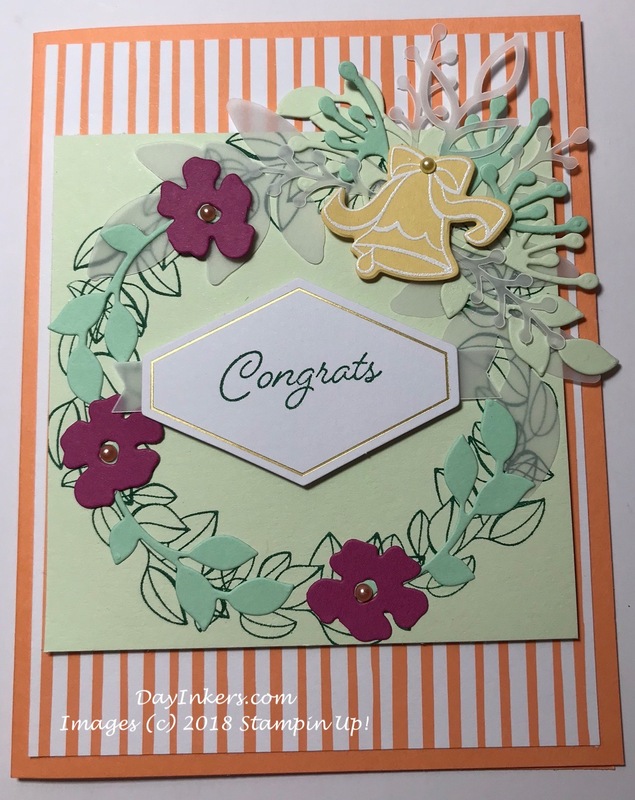 The extra pieces from the leafy die are layered in behind the bell with some vellum pieces left over from a Paper Pumpkin kit. I could have cut them from vellum, but I already had the pieces, so I used them up. The sentiment was stamped in Shaded Spruce, the same color I used on the wreath. That label was a remainder from the Lots of Happy kit. The final touch was some Artisan pearls. This is a fun card for a wedding, birthday or other celebratory events. For this card, I used the Stitched Seasons framelit to cut a big plaque or banner shape. The dies are so cool, they add stitch marks to both the shape that comes out and around the edge of the remaining frame. This means you can get two pretty cards from one quarter-sheet of cardstock. I’ll be using the frame that was left behind in my Winter card so you will see what I mean. The card base is Thick Whisper White. On top of that, I layered Blushing Bride cardstock dry embossed with the Garden Trellis embossing folder. The Shaded Spruce die cut is next. Shaded Spruce is the color that runs through all four of these cards. This rich green color has a hint of blue and is very versatile for mixing with other colors. The flower is a stamp from the set that I stamped in Shaded Spruce and then used watercolor pencils in Lemon Lime Twist, Melon Mambo, and Rich Razzleberry to fill in the image. I fussy cut the whole thing out, which is a bit of a labor of love, but I do think it was worth it. There is a small bud vine at the bottom of the flower spray, I cut that off from where it came out of the image, between the top and middle flower and moved it for better placement. The center of the flowers and the spray have a touch of a new mixed media pain coming out in the 2018 Holiday Catalog. This is the Champagne color. It comes in three others. You’ll be seeing more of this in future posts. The sentiment was stamped in Melon Mambo. I used Layering Ovals to cut out the sentiment and a Blushing Bride base. To finish this card, I added some Lemon Lime Twist and Champagne foil die cuts. This is my favorite time of year. Nice temperature, beautiful colors, my birthday. I enjoy making cards for Thanksgiving and Halloween. And it’s nearly here, just a few more weeks. This card is on a base of Soft Suede stamped in the same ink with the Hardwood background stamp. It gives it such great texture. Another stitched plaque in Shaded Spruce on which to add the beautiful fall leaves. The falling leaf stamp in the set is lovely as is. I stamped the image twice on Very Vanilla cardstock and then colored the images with the new watercolor pencils in Cajun Craze, Crushed Curry, Cherry Cobbler and Pumpkin Pie. I did also add a bit of an accent on one leaf with Early Espresso. I recommend getting both sets of pencils that are now out – the colors all work so well together. I cut all the leaves apart, or at least each image became five leaves or leaf combos. The foil leaves layered over the top were cut with the leaf die from the Stitched Seasons framelits in gold, copper and champagne foil paper. Finally, the sentiment, on Very Vanilla, is from the Painted Harvest stamp set in Soft Suede ink. I did add a layer of burlap ribbon underneath, but I wish I had cut it a bit longer so that it went to the edges of the card. Christmas cards, if you send them like I do, it’s never to early to start making them. For this card, I made a shaker card using some retired shiny stuff that looked like snow. It’s so old, I don’t even remember what it was called and it isn’t in any of my old catalogs, so use sequins or some other filler. To make a shaker card successfully, you need the Foam Adhesive Strips and Window Sheet paper. The card base is Shaded Spruce. If you look closely at the image, you can see the stitches around the plaque that was cut out and used in another card. So clever, Stampin Up! The DSP is Under the Mistletoe in the Annual catalog. The sentiment is heat embossed in Gold. The bow is from the die set as well and I cut it from a scrap of red glimmer paper. I added a few gold pearls as the final touch. A simple but fun card to send maybe to your friends who have children or like to act like children. It really is fun to shake the cards like a snow globe. Do I have to send it? Keep in mind, this set is only available through August 31, 2018, or until supplies run out. If you’d like to get your own bundle, please contact me.